The G7 meet for a summit in Brussels this week. Together these donors provide 70% of official development assistance (ODA) from OECD Development Assistance Committee (DAC) members, but individually their aid as a share of national income varies substantially. The G8 countries committed to increase ODA at their 2005 Gleneagles summit (see the G8’s 2013 accountability report, p19). Aid from the G7 has risen by almost a half since 2004, from US$63 billion to US$92 billion by 2013. This represents 0.26% of their combined gross national income (GNI). But within the group these shares vary from 0.16% in Italy to 0.7% in the UK. 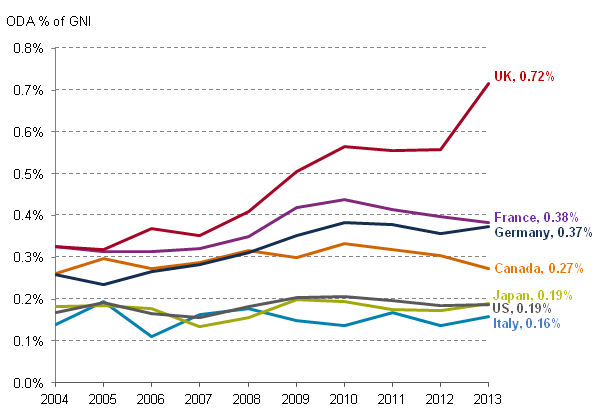 In 2013 the UK became the first G7 country to achieve the long-standing UN target of 0.7% of national income as aid. This was up from 0.33% in 2004 when the UK was the fifth largest DAC donor: it is now the second largest donor behind the US. Italy’s share of national income as aid has fluctuated between 0.1% and 0.2%. On this measure, France, Germany and Canada peaked in 2010, before falling back – although for Germany the ratio rose again in 2013. Japan and the US give similar shares of national income as aid: 0.19% in 2013, and relatively stable since 2009.